Raise your ‘Tide To Go’ pens, put your laundromat on speed dial, and buy a year’s supply of bleach — it’s Your Year in White! It’s not every year a girl gets to wear a special, white, ensemble month after month, so take the necessary precautions, read our list and get to shopping. For the bride who’s always ‘on brand’, wearing white to your bridal shop appointment is a must! Pictured is Olivia Watson of Livvy Land, in a ’70s-esque white, lace top. Her light wash jeans make the look low maintenance and relaxed (perfect for a big shopping day)! Your engagement party is the theatre equivalent of an opening act. No one knows exactly what will happen after, but they’re excited and energetic and no drama has happened yet. Your opening act outfit should be nothing less than dazzling. Ranti, of Ranti in Review, is pictured in a fabulous and classic white dress that would be perfect! Girlfriends, grandmas and gal pals of every kind will gather to shower you with love. While you will want to look and feel great, you’ll also want to feel comfortable. This dress by Moda Operandi is perfect for sipping mimosas and playing party games with all the leading ladies is your life. Plunging necklines are a huge trend right now, but not everyone is comfortable showing all that cleavage in front of gam gam. Your bachelorette party is a perfect time to try the trend! This pantsuit is daring, yet breezy and breathable — perfect for a summer night out with your pals. Do we even need to explain this one? Every dress from BHLDN, Anthropologie’s Wedding collection, is gorgeous and unique. This one is so pretty and so delicate, it’d be a crime NOT to wear it during Your Year in White. We saved the best for last! Your wedding dress is the biggest, baddest, most beautiful white dress you will ever wear. 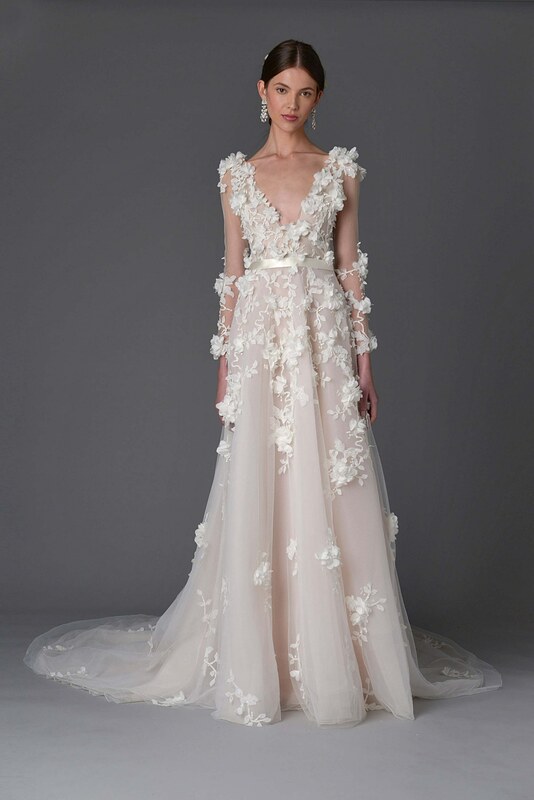 We love the Marchesa, pictured above, but every bride’s taste is a little different! Check out this year’s biggest bridal trends here. (Trust us, there’s something for everyone). What’s your favorite look from our list? Will you be donning white all year long? Any tips on keeping your whites bright and clean? Let’s discuss in the comment below!